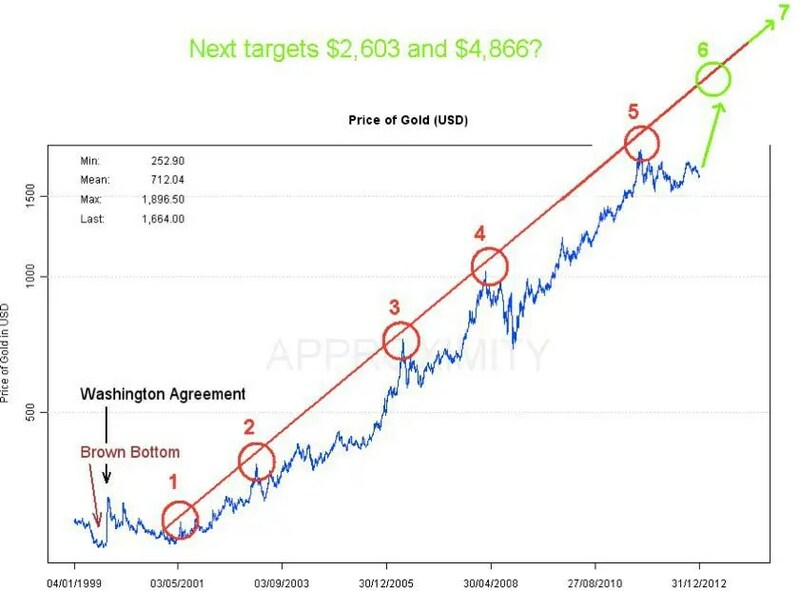 An analysis of surprising similarities between the 5 major spikes in the price of gold since 2001 suggests that if those similarities were applied to the 5th price spike (August, 2011) going forward that it would not be unreasonable to expect a spike to $2,600 in June or July of this year and another spike – to somewhere between $4,700 and $5,050 – in January or February of 2015 . The following analysis is from the Approximity Gold Team (gold.approximity.com) as posted* on SilverBearCafe.com under the title The Roadmap To $4,866 Gold Within 2 Years. the rise from one pair to the next (2 to 3 and 4 to 5), if we assume that the most recent fifth spike belongs to a pair as well, was 89% and 85%. If we take the middle of those two respective moves [i.e. 37.5% and 87%], and also extrapolate the times between them [21-22 months] into the future, we could try and guess what a sixth and a seventh price spike could look like (see also chart below). January of 2015 at $4,865.73 (spike 7). [As such, we] won’t be surprised if gold goes up $1,000 in the next few months. The chart below shows one of the potentially most important cycles in macroeconomics. It plots the Blue Chips of the U.S. industry (the Dow Jones Industrial Average) priced in ounces of gold. The chart shows that when one real asset (industry) is priced in another real asset (gold), one does not get ever increasing prices, but instead major price CYCLES. The chart implies that the amplitude of these DJIA:Gold cycles (possibly due to the increasing degree of leverage in the system) has…[continually expanded ever] since December 23, 1913, when the Federal Reserve Act established the second U.S. central bank, the “Federal Reserve” as we know it today. 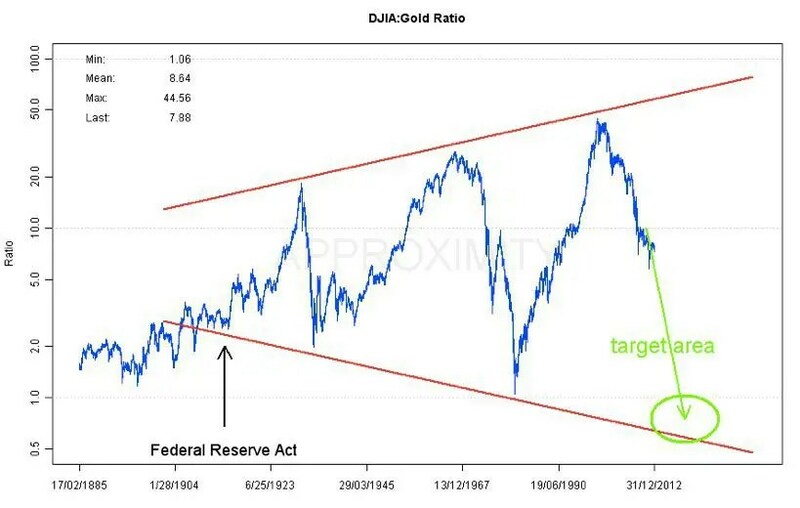 [Accordingly,] a target for the DJIA:Gold ratio below 1:1 seems possible. 7. What Do the Similarities & Differences Between the 1980 Top in Gold & the Current Situation Mean for Its Future? 9. Goldrunner: Gold’s Extremely Bullish Backdrop Setting Stage for Run to $2,050, Then $2,400, Then $4,500 and Ultimately $10,000-12,000! 10. New Analysis Suggests a Parabolic Rise in Price of Gold to $4,380/ozt. 14. Gold’s Recent Price Action Suggests Ultimate Top of $5,000/ozt. Great article and I was very interested in the upward trend it identified, question, would a chart of Silver value reveal a similar trend, if so that would add additional credibility to this article!